Deane is our General Manager for Consulting and is also a practising Principal Consultant with specialist expertise in IT Leadership, Architecture, Agile and DevOps and Change. He helps our clients think outside of their current world view to see different and better ways to achieve results for their organisations. 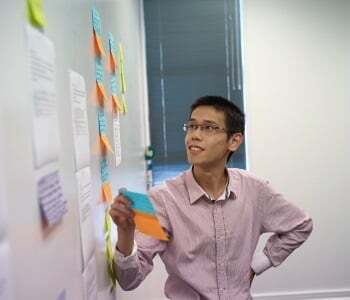 He has a passion for exploring fresh ways of working such as Design Thinking, Lean Start-up, Kanban method and determining how new approaches can be pragmatically applied to make a difference. Deane has previously held the roles of CTO, Software Development Director, and Founder of an innovative internet start-up. "While I have a deep technical background, over the years I have become increasingly focused on the critical people side of IT. The biggest gains that we can make in IT does not come from the technology but from the people, the culture and the transformations we make to continuously improve the way people work. I help our clients to think in new ways to harness the full benefits of their technologies and of their people." Deane is a graduate of the hotly contested Stanford 'd.school' Design Thinking Executive Programme held in Palo Alto. He is a Certified ScrumMaster, Certified in ITIL and Certified TOGAF Practitioner. He is a member of IT Professionals New Zealand and is a Chartered IT Professional New Zealand (CITPNZ). He is also an associate member of the New Zealand Institute of Management (ANZIM). Deane holds a NCB and NZIM Diploma in Management. Deane's 'always on' approach to life doesn't stop outside of work. He has a busy family life with three daughters. He competes in triathlons and he takes stunning motion photographs of the night sky. What we did: Equinox IT provided full development services for a central government agency core business application. This was a multiple year project with numerous releases and ongoing enhancements. Equinox IT provided a full team of .Net developers and systems analysts / testers using Agile, Kanban and Acceptance Test Driven Development approaches. Each release was rigorously tested to ensure we consistently met the high expectations of the client. Equinox IT continues to support this core business application today. Deliverables: Delivery and support of numerous core business application releases with documentation.